While Filipino champion Manny Pacquiao was busy hammering American boxer Timothy Bradley during their April 13 rematch (Saturday evening in Las Vegas, Nevada), someone else caught the attention of local and international journalists alike – his mother Dionisia Pacquiao. Sometime during the third round of her son’s bout, the flamboyant 64-year-old was seen on television moving wildly from her ringside seat. She wore a white Filipiniana dress for the fight. She appeared to be shouting words against her son’s opponent while clutching a rosary and a prayer booklet. At what point, she also seemed to show a dirty finger (although that may be unintentional). 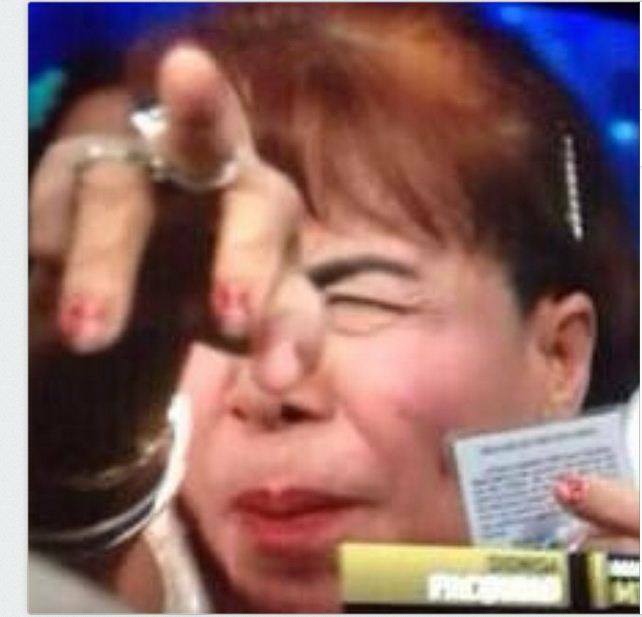 Some observers joked that Mrs. Pacquiao may have cast a “voodoo hex” against her son’s rival. Manny Pacquiao ended the night on a victorious note, snatching the WBO welterweight title from Bradley via a convincing unanimous decision – 118-110, 116-112, and 116-112. Curiously, the mother of the returning champion approached Bradley shortly after ring announcer Michael Buffer declared the judges’ decision. What she told her son’s vanquished opponent remains not known. But clearly, his mom made her presence felt, with the venerable American newspaper USA Today dubbing her the “star of the night.” Also, new Internet memes featuring this image has become viral.